Your lead-in to the question "are wrong" and then proposing a "view" is a disconnect in logic. Actually its not too bad ive actually inadvertently installed a 4 point floaing suspension system for my relay panel, its completely unaffected by bumps..
Ha, that's too awesome Rob, and I'm glad you've got a sense of humor about all this! And you know what, I've finally figured out what that extra "b" in your screen name represents - BUNGEE, of course!!! OK i know I'm going to get a lot of negative feedback here. But here goes. For a forced induction engine equal length headers are useless. The fact that there is a turbocharger in the line causes back pressure which negates any scavenging effect of having the pulses of each exhaust valve opening and closing being lined up. The best bet for a forced induction set of headers is the smallest volume ie shorties length possible to reduce turbo lag. Now there is an exception for the twin scroll versions since the sides have to be balanced to take advantage of it. I have talked to a few people who have actually tested this on a dyno and they confirmed what i was thinking. Equal length headers are designed for normally aspirated motors so that the exhaust pulses line up behind one another ans they flow into the collector. This results in a vacuum scavenging effect in the primaries and increased flow through the exhaust valves. Any way chose to believe it or not but if there really was anything to gain by equal length headers on a turbo motor all of the factory race teams would have used them. Instead they went with shorties on the 935's and also later turbo 3.6's etc. I can't simplify this enough for my logic that equal is better. 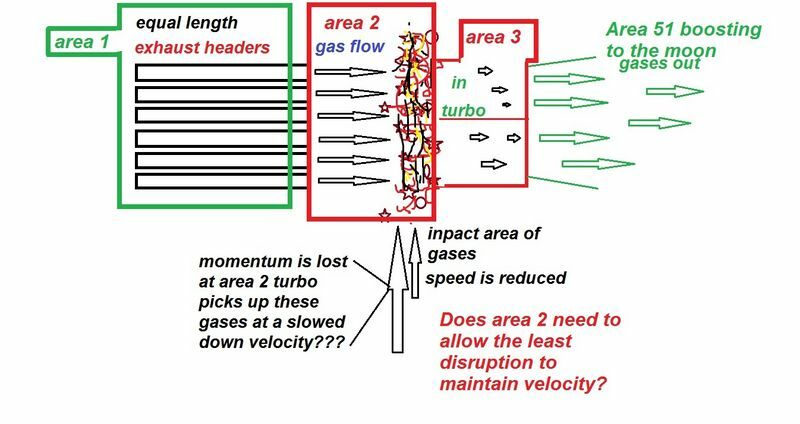 If 2 or more cylinders exhaust pulses/energy with unequal length primaries roughly arrive at the same time in a collector or T flange, how can the energy NOT be negated? Both or more pulses are trying to occupy the same area reducing gas energy. With perfect cadence, the pulses would have an easier time passing through the tubes/collector. Not saying I'm right, it's just my logic with zero fluid dynamics background. On this Logic At the point of gases arriving in that area the collecter should be very large ? that would allow all he gases to pass without slowing down to where they go to? Not discounting I think Mr Rarly has done great work (your welcome)and studies and he has many facts to back it up, i think however there are areas that could be changed to make a better system or are we at the point of 100 percent perfecton already? It's not the same time if the engine has a fireing order. Actually thats right i think? So theres that area to consider.. If engines dizzy is spinning around and sending spark to each cylinder then the gases at cylinder 4 (depending on rotation) are waiting to be sparked he is last in line something to think about also? Everybody buy some u-bends, j-bends, and straight sections from Jegs or Summit. equal length, pulse tuned length, 180° , tri-y, 6 into 1. Then build all of these one more time, but in step-tube sizes. 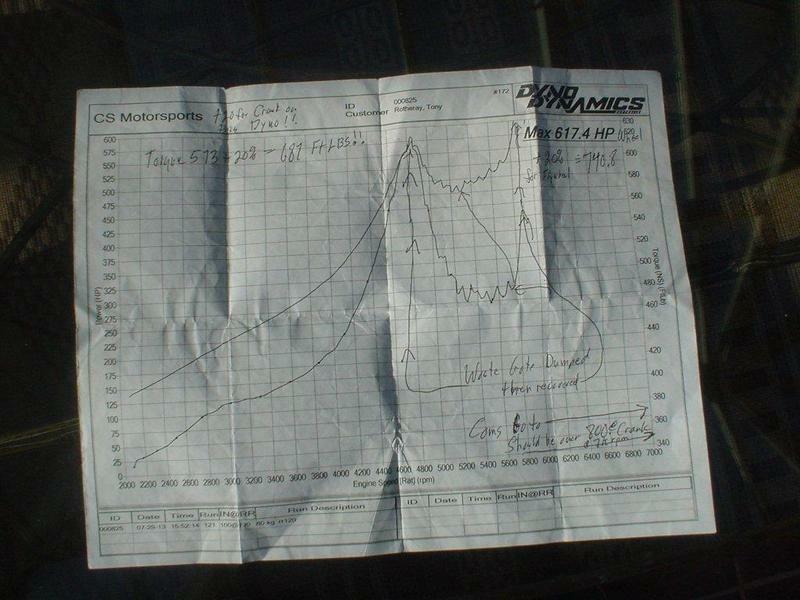 Then lets install and run on the dyno for comparisons of rwhp/Tq. Keep in mind that forced induction engines push exhaust gasses around different from n/a engines, yet another variable in the design criteria. Lots of work ahead of us ! No need for welding skills - just cable tie that bit@h in place! I did a fair amount of header research when designing our equal length 930 headers. Conventional wisdom at the time was the shorter the better. Turned out that was only half the story. The full story was the shorter the equal length the better. What true equal length primaries and secondaries do for you in a turbo application is allow the engine to produce more torque off boost and then to produce more peak power on boost. This is in a street application mind you, racing is a whole different ballgame. I dyno tested every system I could get my hands on using the same engine. The equal length system is magic. The tuned sound alone was worth the effort. The key is for each pulse to reach the turbo in the same timing as the firing order, not a mish mash of odd fire pulses. Each pulse hits the turbine in a coordinated efficient beat. Building short tube headers is easy and gives you a high percentage of gain over standard heat exchangers. I would not have gone to all the effort and expense to build a tuned system if it had no added benefit. This is not a new or unique idea. Can you post some of your results for torque and hp that you validated when testing your equal length headers against other designs such as the B&B or OBX headers that alot of us have installed on our turbos? I like to see testing and want to see the gains since you went thru the trouble of doing back to back tests. Could you post a few dyno graphs for us here? Shouldn't be too much trouble I hope. Last edited by fredmeister; 05-10-2014 at 04:37 AM.. The exhaust is not CONSTANT, it's PULSING. With, I assume, a bell curve in velocity and CFM from start of each pulsing event until stop. But again, never took fluid dynamics as an ME has. Turbos produce power using heat and velocity. Heat is easy, it is velocity that I fucus on. This is covered well in Corky's book. The primary internal diameter must be matched to the ports and the application. Too big and you lose velocity (increase lag) but increase top end HP capacity (huge turbo airflow). Match the primaries to the ports and you optimise off boost torque and reduce lag. We use merge collectors to further optimise the flow transition toward the turbo. The path is continually restricted until it reaches the turbo flange where all the energy is focusted. I have posted dyno graphs of short tube versus tuned headers when we were testing these headers. 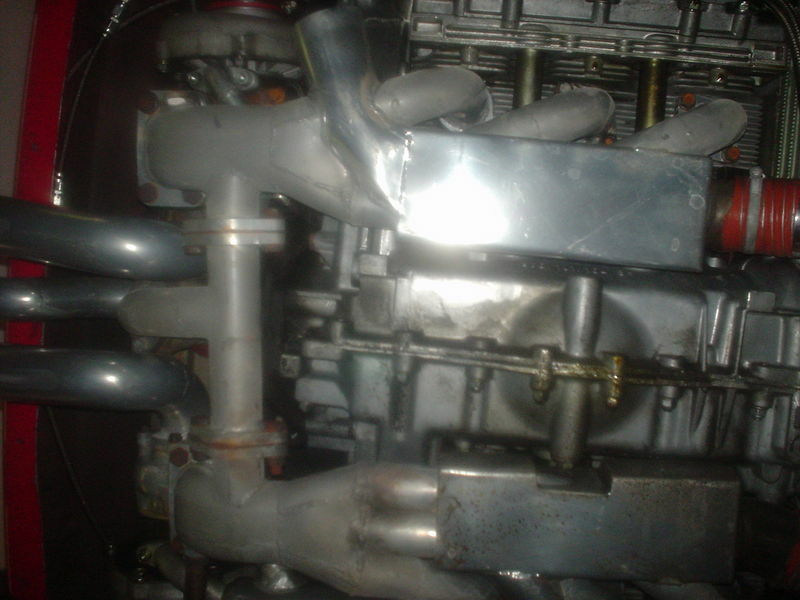 Controlling boost creep was thrown in the mix as well due to the poor design of the elephant nose waste gate circuit of the short tube headers. That muddied the water a bit as more boost equals more power. I'll look up the graph. For purely testing purposes and low cost, I've found that PVC pipe and duct tape make the best rig. Just mock it up, tape it up, and make a dyno run. Easy, quick, and disposable! "Too much is just enough." Why use such costly materials for the experiment? I prefer paper towel and toilet paper rolls and cost effective scotch tape. Oh, and forget a flowbench, I found a child's pinwheel works just fine for reading velocity. I assume we all agree that two major factors are important. Lengt of runners and equal length. While from, a scientific perspective, this is a fact, we operate under certain constraints, so we have to compromise, I think Brian can confirm this during his testing. By compromise, I mean it is not possible to achieve the shortest possible headers, while also being equal length. The result of this is that the longer runners required to achieve equal length somewhat take away the benefit ( note I did not say remove, just negatively affect) to what degree is beyond me. The key piece from this is, both considerations are valid, however, reality is a compromise. This compromise (or rather optimization) is where the money is made. [QUOTE=Robbbyg;8057139]On this Logic At the point of gases arriving in that area the collecter should be very large ? that would allow all he gases to pass without slowing down to where they go to? Good thinking, sort of like this? Norwood build, circa 2002. 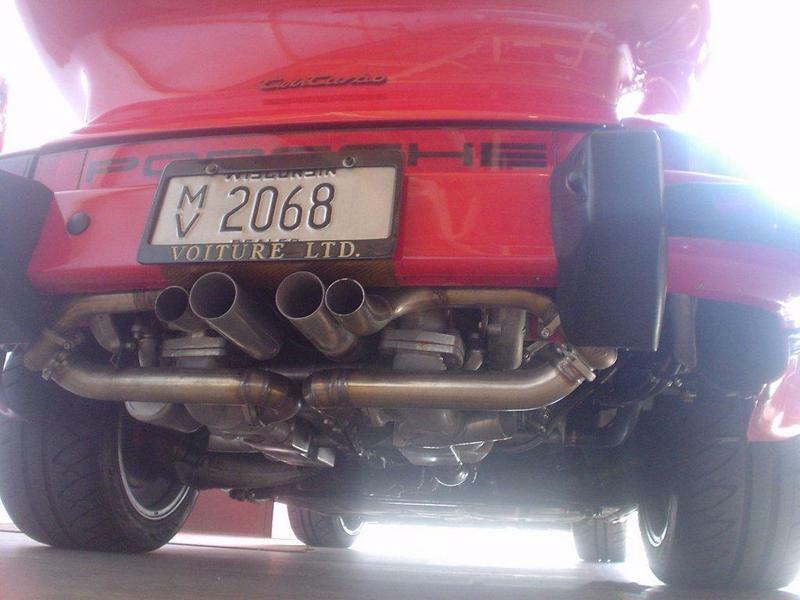 Also I think the 935 header was very similar. So i think a patent is out of the question. Last edited by voitureltd; 05-10-2014 at 11:00 AM..
Now with 2 tial 50MM wastegates. No more "uncontrollable" wheel spinning waste gate malfunction. Last edited by voitureltd; 05-10-2014 at 10:59 AM..
First time I've seen that one. Looks like it works well from the dyno print out. Changing oil looks like it makes a mess on the heat exchanger under the drain plug. I am not sure I understand your logic, but if I do. When the gases merge into a smaller area, the gases do not slow down, they speed up. Yep, lots of "hot air" being blown about! Yeah, my "primary" thought is to do a "header" off a 3rd floor. But, due to the "velocity" of getting ready for Mother's Day, I've "spent" my "gasses" leaving me too "exhausted" to do so. I hope we all "merge" our thoughts of this topic into our precious forum that is essentially a "collector" of opinion and loosely scientific facts. Last edited by Tippy; 05-10-2014 at 01:32 PM..